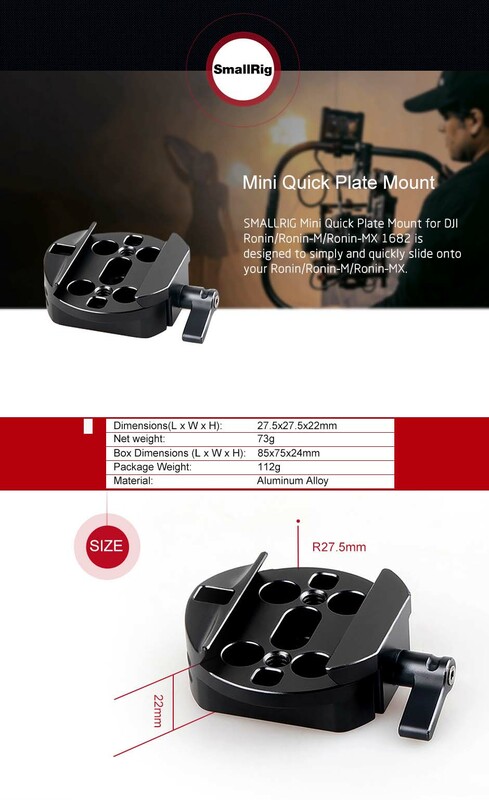 DJI Ronin/Ronin-M/Ronin MX Quick Plate Mount could be slid onto Ronin/Ronin-M/Ronin-MX quickly. It could lock stabilizer shaft first on the one end and then attach QR plate on the other end and sit on the tripod, thus it could be switched from handheld mode to tripod mode. It features two Ronin anti-release holes that makes no direction restriction for installation. SmallRig has produced many good products with reasonable prices. SmallRig has produced many good products with reasonable prices. I like the quick plate mount much. It is what it describes, and it matches my Ronin M perfectly. It is very convenient to mount RoninM on the tripod or crane. It is cheaper than many products of other brands. I stronger recommend this.